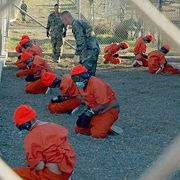 One of the strongest arguments against giving the terrorists detained at Guantanamo Bay their day in court and the same rights as anyone else, is the prospect that the legal evidence against them might not be sufficient. Therefore, they might get to walk and go back to their terrorists ways--as previous Gitmo inmates have done. But I doubt few considered that our legal system might not only set some of the Gitmo terrorists free, but allow them to live free in the United States! The Wall Street Journal has a story on this likely scenario--courtesy of the US Supreme Court and Justice Anthony Kennedy. The onus is now on Congress to legislate a solution preventing "the terrorists next door." But will this Congress have any interest in doing so? A liberal Congress perhaps joined by a socialist president, Barack Obama? Seems absurdly unlikely to me, as their opinions would coincide with Kennedy's judgment. Wall Street isn't the only American institution suffering a meltdown; it is joined by our legal and legislative branches of government as well. Once we've "turned ourselves upside down" and seen the other side, then what?